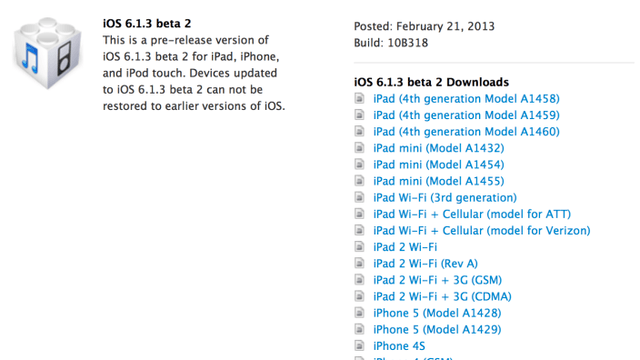 iOS 6.1.3 To Fix Security Flaw, iPad 5 Due in Q3? iOS 6 was a big improvement over the previous iOS release (not counting map issues). But it has not been without bugs. Apple has already patched a few things in the software already. With the release of iOS 6.1.3 beta to developers, it seems Apple has fixed the lock screen security flaw. This is only for developers at this point, so we will have to wait a bit before it is released to the public. If you have jailbroken your phone with Evasi0n, you may want to wait to see whether this upcoming update makes the hack useless. Apple may even be able to drop its production costs. We highly doubt the company would pass the savings to consumers if that happened. The iPad 5 may become Apple’s top tablet in a few months but the iPad Mini 2 should remain just as popular.